The Coaterbot is the only precision coatings and spray foam applicator, in one, in the industry. 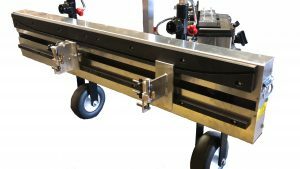 Designed to accurately apply material with an end-pass rotation, the Coaterbot won’t miss critical parts of the surface – allowing for more accurate millage. Featuring a floating gun mount that allows for control and fast turnaround speed without losing precision. It is ideal for single component applications such as; silicones, urethanes, built up roof coatings, metal roof coatings, and more. For those that already own a Spraybot, the Coaterbot is a great addition. SPECIALIZED EQUIPMENT: Mechanical or computer controlled with variable sizes, includes in-plant production.